Draft: 2013, Cincinnati Reds, 1st rd. Was selected by the Reds with the 27th overall pick of the June 2013 first-year player draft...was scouted and signed by Ben Jones...became the first baseball player drafted out of Samford University and the highest draft pick in the school's history in any sport...in 2016 was the Southern League All-Star Game's Top Star and the SL's Batter of the Week for 4/25-5/1..in 2015 was a mid-season Florida State League All-Star, MiLB.com Organization All-Star and Arizona Fall League Rising Star..in 2013 twice was named Pioneer League Player of the Week (6/14-6/20, 7/17-7/22) and was rated the organization's best hitter for average...in January 2017 attended Major League Baseball's Rookie Development Program. Played baseball, football and basketball at LeRoy (AL) High School...majored in sociology at Samford University in Birmingham, AL, where as a junior in 2013 he was a pre-season All-American and pre-season Southern Conference Player of the Year...finished that 2013 season hitting .337 (55g, 14 2b, 11hr, 40rbi, 21sb, 58r), then was selected by the Reds in the draft's first round...follow on Twitter @Mr_MagicErvin. 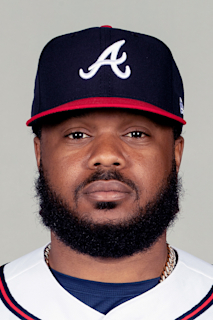 Was 1 of 5 rookies on the Opening Day roster (RHP Tyler Mahle, RHP Jackson Stephens, RHP Zack Weiss, OF Jesse Winker)...was his first Opening Day roster...overall had 3 stints on the Reds' roster, from Opening Day-4/25 (16g, 8gs), 6/21-6/23 (3g) and 7/20-remainder of the season (59g, 48gs)...made his 56 starts in LF (29gs), RF (24gs) and CF (3gs)...following 19 consecutive starts in LF (8/26-9/19), made his last 5 starts of the season in RF while Scott Schebler played LF...also made 1 pitching appearance (8/8 at NYM)...made 42 of his 56 starts after 7/30, when LF Adam Duvall was traded to the Braves...with 1 out in the eighth inning on 7/23 vs StL broke up the Cardinals' no-hitter with a pinch-hit single off reliever Jordan Hicks...in that game, Cardinals starter RHP Daniel Poncedeleon made his Major League debut with 7.0 hitless innings (3bb, 3k)...with 2 outs in the bottom of the eighth of the 8-0 loss on 8/8 at NYM made the first pitching appearance of his career, induced Devin Mesoraco to ground out and end the inning...was the third of 4 Reds position players to pitch in 2018 (Cliff Pennington, Alex Blandino, Brandon Dixon)...in the 11th inning of the 2-1 win on 8/17 vs SF hit the first walkoff HR of his career (solo off Ray Black)...in the 12-6 win on 9/7 win vs SD produced his first career 2-HR game (off Matt Strahm, Miguel Diaz), a career-high 4 runs and tied career highs with 3 hits and 4 RBI...was 1 of only 2 Reds batters to score 4 runs in a game in 2018 (José Peraza)...in his last 23 apps at Louisville prior to his 7/20 promotion hit .384 with 13 multi-hit games (5hr, 29rbi, .450obp, .663slg, 1.113 ops)...from 4/30-5/17 was on Louisville's disabled list with a left thumb sprain. Spent most of the season at Class AAA Louisville, where he led the team and ranked T4th in the International League in stolen bases (23)...reached base safely in 78 of his 99 apps...in his Major League debut made 28 apps and 11 starts during 4 stints for the Reds...from 4/21-4/25 made 2 pinch-hit apps and an appearance in RF as a defensive replacement...from 8/1-8/5 was on the roster for 5 days but did not make an appearance...from 8/15-8/22 went 5-for-8 with a double, 2 HR and 6 RBI in 4 apps, including his first career start (RF, 8/17 at Chi)...joined the Reds for the final time on 8/25, when OF Jesse Winker was disabled, and hit .208 in 21 apps and 10 starts the rest of the season...for the Reds played LF (5g, 1gs), RF (5g, 3gs) and CF (9g, 7gs)...after Billy Hamilton suffered a fractured thumb on 9/6, started in the outfield in 3 of the Reds' 4 games (2gs in CF, 1gs in LF) until Jesse Winker came off the DL on 9/12...in the second inning of the 12-8 loss on 4/22 vs Cubs made his Major League debut as a pinch hitter and off Jake Arrieta hit into a fielder's choice...on 8/16 at Cubs entered the game in RF as part of a double switch and homered off Hector Rondon for his first Major League hit... became the first Reds batter to homer for his first career hit since Juan Encarnacion did it on 9/18/09 vs Fla off Leo Nunez...in the 13-10 win on 8/17 at Cubs made his first career start (RF) and hit a 2-run HR in the top of the seventh inning that snapped the 9-9 tie (3-4, 1 2b, 1hr, 4rbi, 1bb, 3r)...entered the season rated by Baseball America the 18th-best prospect in the organization. In his first full season at Class AA, for Pensacola was the Southern League All-Star Game's Top Star and the SL's Batter of the Week for 4/25-5/1...with 36 stolen bases led all Reds minor league players (36-46, 78%)...among Southern League leaders ranked fourth in walks and stolen bases...homered once every 32.23 at bats, fifth-best ratio in the league...attended his first Major League spring training camp (9g, 3gs, .391, 1 2b, 2hr, 5rbi, 1sb)...made 2 exhibition starts at DH and 1 start in CF...overall made 3 apps in LF and 4 apps in CF...on 11/18 was added to the Reds' 40-man roster. April 15, 2019 Cincinnati Reds optioned RF Phillip Ervin to Louisville Bats. April 12, 2019 Cincinnati Reds recalled Phillip Ervin from Louisville Bats. March 22, 2019 Cincinnati Reds optioned RF Phillip Ervin to Louisville Bats. July 20, 2018 Cincinnati Reds recalled RF Phillip Ervin from Louisville Bats. June 24, 2018 Cincinnati Reds optioned LF Phillip Ervin to Louisville Bats. June 21, 2018 Cincinnati Reds recalled Phillip Ervin from Louisville Bats. April 26, 2018 Cincinnati Reds optioned LF Phillip Ervin to Louisville Bats. August 25, 2017 Cincinnati Reds recalled Phillip Ervin from Louisville Bats. August 23, 2017 Cincinnati Reds optioned LF Phillip Ervin to Louisville Bats. August 15, 2017 Cincinnati Reds recalled Phillip Ervin from Louisville Bats. August 6, 2017 Cincinnati Reds optioned LF Phillip Ervin to Louisville Bats. August 1, 2017 Cincinnati Reds recalled Phillip Ervin from Louisville Bats. April 26, 2017 Cincinnati Reds optioned LF Phillip Ervin to Louisville Bats. April 21, 2017 Cincinnati Reds recalled Phillip Ervin from Louisville Bats. March 22, 2017 Cincinnati Reds optioned LF Phillip Ervin to Louisville Bats. November 18, 2016 Cincinnati Reds selected the contract of Phillip Ervin from Pensacola Blue Wahoos. December 18, 2015 Cincinnati Reds invited non-roster CF Phillip Ervin to spring training. August 20, 2015 LF Phillip Ervin assigned to Pensacola Blue Wahoos from Daytona Tortugas. July 6, 2015 Daytona Tortugas activated CF Phillip Ervin from the 7-day disabled list. June 28, 2015 Daytona Tortugas placed CF Phillip Ervin on the 7-day disabled list. April 3, 2015 CF Phillip Ervin assigned to Daytona Tortugas from Dayton Dragons. March 5, 2015 OF Phillip Ervin assigned to Cincinnati Reds. April 1, 2014 CF Phillip Ervin assigned to Dayton Dragons from Louisville Bats. March 29, 2014 OF Phillip Ervin assigned to Louisville Bats from Dayton Dragons. March 19, 2014 SS Phillip Ervin assigned to Cincinnati Reds. September 11, 2013 Dayton Dragons activated OF Phillip Ervin from the 7-day disabled list. August 16, 2013 Dayton Dragons placed OF Phillip Ervin on the 7-day disabled list. July 30, 2013 OF Phillip Ervin assigned to Dayton Dragons from Billings Mustangs. June 20, 2013 Phillip Ervin assigned to Billings Mustangs. June 10, 2013 Cincinnati Reds signed OF Phillip Ervin.